Total length: 34 cm, blade length: 20 cm - item number: 1891686032 - Other knife types and set combinations are available for this knife collection. Material: Forged blade made of rust-free and acid resistant speciality blade steel. Long lasting sharpness thanks to the hardened blade. Riveted handle without grooves made of high-quality plastic. Performance Cut technology: Combination of traditional forging processes with state-of-the-art precision technology for extraordinary long lasting sharpness. Ergonomically shaped handle and perfectly balanced weight of blade and handle for comfortable handling. Jointless workmanship makes it perfectly sanitary - no noticeable transitions between blade, guard and handle. Cleaning the knife: Hand-wash.
Made in Germany - Knife in premium quality, manufactured at our own blade forge in Germany. Classic meets modern - traditional visible studs in modern design. Beef, chicken or lamb, raw, cooked or roasted: a carving knife will carve or cut through any type of meat with ease. Carving knives have a slightly curved, pointed blade of between 15 and 30 centimetres in length. This is the optimal length for slicing through even the thickest of roasts without any great resistance. And best of all: carving knives cut with such precision that they cleanly sever the fine fibres of the meat while retaining the meat’s precious juices. WMF carving knives are precision ground, making them not only extremely sharp, but also extremely durable. They are available in a range of designs for both amateur and professional cooks. Incidentally, carving knives are also ideal for preparing fish. A touch of nostalgia coupled with state-of-the-art workmanship – this sums up the WMF Grand Class knife series. The design of the black handles with stainless steel rivets is reminiscent of traditional craftsmanship of days gone by. While the modern, seamless design of the high-quality plastic handles guarantee optimum hygiene, the ergonomic shape ensures convenient and secure handling. The bolster serves to protect fingers when cutting. Like all WMF knives, the knives in the Grand Class series are made from high-grade special blade steel, forged along their entire length. Finally, Performance Cut technology gives the blades their exceptional, long-lasting sharpness. 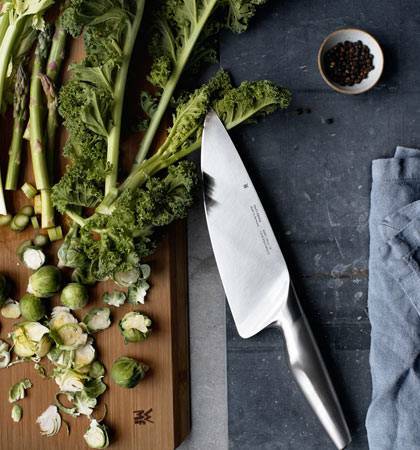 The collection includes a chef’s knife and a carving knife with various blade lengths, an all-purpose knife, a vegetable, bread and kitchen knife, as well as a Santoku, larding, preparing and peeling knife. Cut for as long as you want. Your knife always stays uniquely sharp. What does Performance Cut Technology mean? It is the combination of the traditional forging process with the latest precision technology. It is, for instance, a new, innovative finishing of the steel and a high-precision sharpening process of the blades. This results in knives with an optimal cutting angle, which remain sharp for an unbelievably long time. Performance Cut combines traditional forging methods with the latest developments in precision technology. Performance Cut technology for outstanding and long-lasting sharpness. Blades made of forged special blade steel.  WMF follows the tradition of cutlers and uses particular care for this craft. From 2014, the company will combine the traditional art of forging with the latest precision technology in manufacturing. Tests show that WMF household knives that are made with this Performance Cut Technology exceed the standard for cutting performance by double. In Hayingen, a small town in the middle of the Swabian Alb, WMF operates one of the largest blade forges in Germany. Annually, hundreds of thousands of knives are made in the company's own factory according to the traditional drop forging process. In this process, blades made of special blade steel are worked over the whole length with the forging hammer. About 30 work steps are required before the customer is holding a knife of the highest quality in their hands: From the examination of the raw material to the packaging and shipping of the knife. Every work step is subject to strict quality controls. Only in this way can WMF ensure the high quality standard at every phase of the manufacturing process. 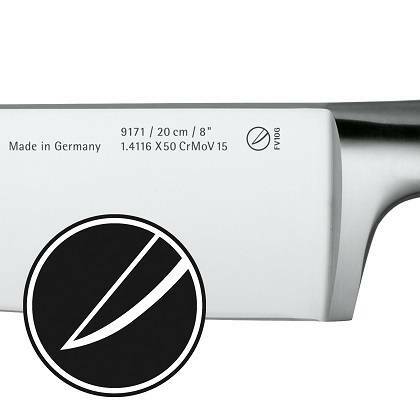 The result is 'Made in Germany' knife blades that are phenomenally sharp, precise in their cut and retain their cutting performance for a long time. Meat is an essential part of the modern diet. Whether you go for a traditional chicken or the most exquisite fillet steak, you'll be ready for anything with our WMF carving knives. Carving knives make working with meat easier. When slicing or carving meat it's extra important to use a sharp knife. WMF carving knives have been precisely ground to make them as sharp as possible. What makes carving knives stand out is their blade length of between 15 and 30 cm – the ideal length to cut the meat fibres cleanly. This means that when you carve meat you don't lose any of its valuable juices. The blade of the carving knife is typically curved and tapers at the front, whilst the spine tends to be straight. You can also use our carving knives to carve or slice raw meat as well as meat that has been cooked or fried. 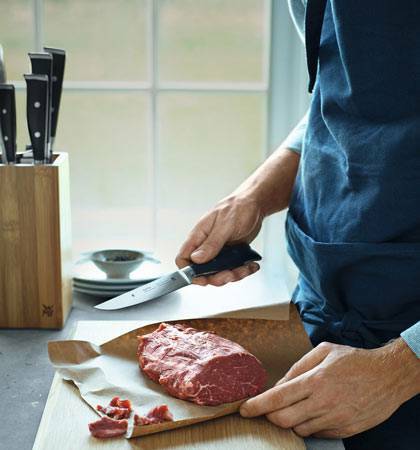 An extravagant fillet steak, tough bison meat, soft chicken or expensive quail meat – WMF carving knives cut through every meat fibre without destroying the nutritional value within them. In our carving knife category you will find knives for beginners and professionals alike. WMF carving knives impress with their range of potential uses. Surprise your guests with wafer-thin fillet slices or cut your meat into small, delicate chunks and serve them in a tasty salad! Let your imagination run wild! 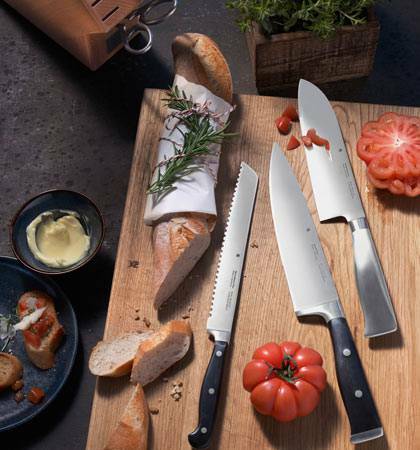 You can choose knives from the Chef's Edition, Grand Class, Grand Gourmet or Spitzenklasse Plus ranges. When you buy one of our knives you will receive a top-quality product that is built to last and is the result of real, quality German workmanship. The seamless finish guarantees that the knives are hygienic, as there are no spaces for bacteria to get into. This is something to warm the heart of every cook, whether an absolute beginner or an old hand in the kitchen! WMF carving knives will impress you with their excellent workmanship and durability. You can choose between carving knives made from many different materials. The WMF Damasteel carving knives combine traditional forging techniques with a modern look. Forged special blade steel will make the heart of any cooking lover beat that little bit faster, as the so-called 15% chromium-molybdenum-vanadium steel is known for its unique cutting properties and long-lasting finish. 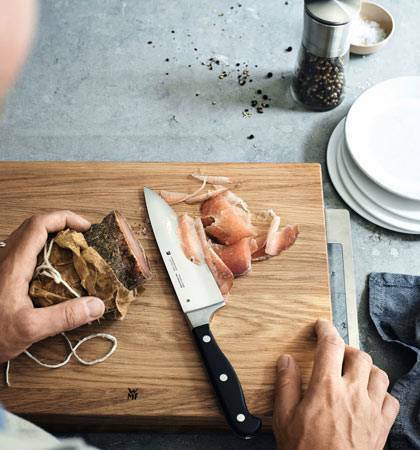 All WMF carving knives are rust-proof and acid-resistant. Experience the next generation of meat preparation and discover the extra-sharp carving knives in the WMF online shop! Staying sharp – you can't do anything without knives! Where would a chef be without knives? A knife that does what it's supposed to – that is to say, cut – is the most important thing any chef can have in their kitchen, whether you're a budding amateur or a seasoned professional. You can find the right tool for cutting any kind of food in the WMF assortment. Knives, originally just sharp blades made from stone, wood, bone and other hard materials, have been used since prehistoric times. Nothing can happen without a knife, especially not in the kitchen. The kitchen gadgets are used to chop up meat, vegetables and many other foodstuffs. You can find the right knife for any kind of use in the WMF shop. Among other things, we develop chef's knives designed for universal application in a wide range of designs and in line with our collections, and likewise bread knives, vegetable knives and carving knives. 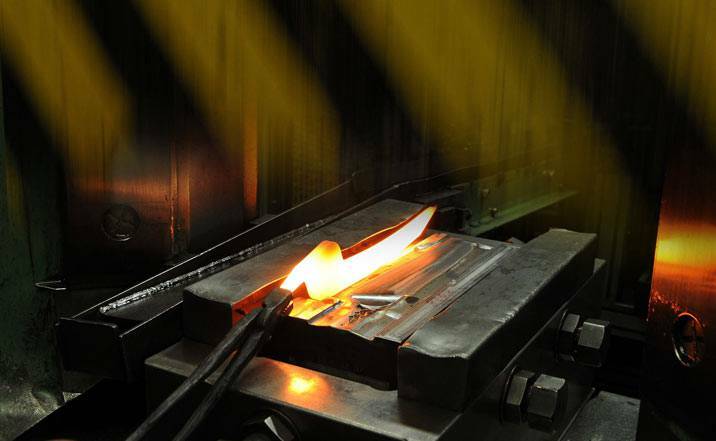 The blades are forged in the traditional way at our workshop in Hayingen. Our quality knives keep for years and years if they are well cared for, and if necessary they can be sharpened with a steel or a knife sharpener. It's like cutting through butter! Good tools are the basis of good results, whether in the kitchen or the workshop. Knives and their various designs are no exception. A good knife will cut through any food cleanly and effortlessly, which also applies to our carving knives, which can go through any food like cutting through butter. For our more aesthetically-minded customers, we offer Santoku knives and Chinese knives, and our chopping knives are perfect for chopping up things like herbs, garlic, ginger or onions without breaking into a sweat and in a way that retains their flavour. Our eagle-eyed customers can see the quality of our knives straight away. Our blades are made from 15% chromium-molybdenum-vanadium steel and the alloy is etched onto the blade of each knife. The transition from the blade to the handle is forged. The so-called bolster keeps the finger apart from the blade, which lets you work safely. You won't find any joints on our knives. Seamless transitions are more hygienic and give the knives stability. Our knives don't just start off sharp - they stay that way. Our assortment includes knives for any kind of application in a range of designs. We think our knife sets are especially practical together with a blade guard or a knife block. No matter which of our knives you choose to go for – you can cut safely with us!